The KitchenAid Nespresso Artisan is a large machine that oozes style while brewing top line espresso – read on for our full review. See also: The Best Coffee Machines of 2017. The Nespresso KitchenAid Artisan coffee capsule machine is all you’d expect when combining these two powerhouse appliance brands. This machine guarantees style and quality coffee. However, it’s not cheap and there’s no milk wand. See also Nespresso Krups Prodigio review. 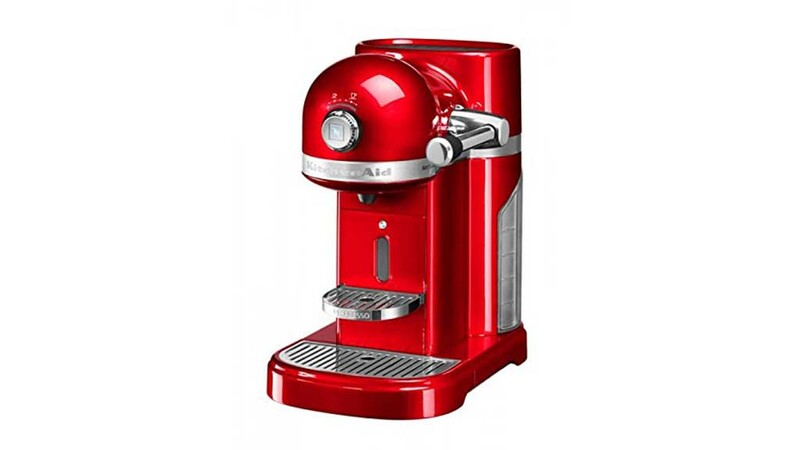 Nespresso and KitchenAid are well known for class and quality. Put the two together and you have an eye-catching and stylistic coffee capsule machine. The KitchenAid Nespresso Artisan coffee capsule machine is not a unit that wants to blend into the background. If you’re buying this appliance, it is going to make an impact. Size wise, the machine is H33xW20.8xD33cm and weighs 8.9kg. Clearly, this was not designed to be stored in a cupboard. The size does, however, allow for one of the biggest water tanks on the market. It holds 1.4L of water which heats in less than 30 seconds. The machine is available in six different colours: Empire Red, Onyx Black, Almond Cream, Candy Apple, Frosted Pear and Medallion Silver. Note: If you like this design, check out the Smeg ECF01 too. The Nespresso KitchenAid Artisan is also built with a 19-bar high-pressure system. High pressure is directly linked to good coffee. There are also six pre-programmed cup sizes. These are 25ml, 40ml, 60ml, 90ml, 110ml and 130 ml. Even with its large dimensions, there wasn’t enough room for a milk frothing wand. So while it leads most in making hot, perfectly brewed espressos and Americanos, buyers miss out on the option for cappuccinos or lattes. Of course, you can always buy a separate milk-frothing appliance, but these cost between £10 and £50 depending on what sort of quality you’re after. 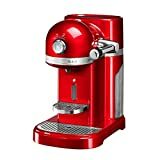 Both Nespresso and KitchenAid have reputations for making easy to use products. The Nespresso KitchenAid Artisan is no different. Simply choose the length of the drink you want using the front dial, pop in a capsule and of pull the lever over until it has pierced the capsule. Then just push the central brew button. Easy. A great feature of this machine is that you don’t need to choose your favourite drink length every time. After 11 uses, the clever Artisan machine automatically identifies most-used setting and defers to that unless instructed otherwise. The dial also functions to display the length of standby time and a descaling programme. Once your coffee has poured, simply rotate the lever back into position and your used pod will drop into the disposal container (which can hold about 14 pods). Ideal for heavy coffee drinkers. The Nespresso KitchenAid Artisan unit’s 19-bar pressure pump will brew espresso of the highest quality. The machine only works with Nespresso coffee capsules (or third party ones designed to be the same shape). While some people find Nespresso-only coffee capsules annoying and expensive, it’s worth noting their high standards. Especially when it comes to taste, range and sustainability. With six families of coffee, each with their own sets of flavours, there will be at least one flavour to suit everyone. This means the higher cost for Nespresso coffee capsules, compared to other brands, will be worth it for the delicious coffee you get in return. KitchenAid Nespresso Artisan review: Value for money? If you’re looking for a stylistic capsule machine to sit proudly in your kitchen then this unit is for you. This machine guarantees barista-standard coffee. The price tag buys you two industry-leading brands for one, as well as the design and functional expertise they bring. It’s not cheap (or small), but the Nespresso KitchenAid Artisan makes high-quality coffee while looking good.